About a scene Football and India – do they go together? The next FIFA World Cup will get under way in Russia on 14 June 2018 and will continue until 15 July 2018. What not many people know: the last U-17 World Cup was held in India. In search of Germany’s favourite sport in India. Not long ago, in November, Kheleo, a clouded leopard and the mascot for the event, adorned billboards in New Delhi. #FootballTakesOver was splashed across. This was during the U–17 FIFA World Cup held last year. Yet the euphoria did not spill over. India is a cricketing nation. Football has it tough. Even billboards cannot prevent this. ‘I watched some of the matches that were broadcast,’ says Omar, 23, who works as a street vendor just a couple of kilometres away from the Jawaharlal Nehru Stadium. He saw a few fans in football jerseys, he says, but otherwise he hasn’t really taken much of an interest in the tournament. Football in India has its centres: West Bengal and Assam in the north-east, Goa on the west coast, scattered across Mumbai and across Kerala and Chennai in the south. Nevertheless, the game has a limited public presence in Mumbai, Chennai or New Delhi, even though these cities can boast of having some professional clubs: Mumbai City FC, Delhi Dynamos and even two clubs in the south – Chennaiyin and Chennai City FC. To be fair, all but the last mentioned (Chennai City FC) were established only in 2014. The scene in Kolkata is different. The city is known for its football culture: 'The three big football clubs in India are Mohun Bagan AC, East Bengal FC and Mohammedan Sporting Club,’ says a member of the All India Football Federation (AIFF). These are clubs with a hundred-year-old history, and all are from Kolkata. And then there is Atlético de Kolkata, which was established with the help of Atlético Madrid four years ago. In contrast, AIFF was founded in 1948, just a year after the birth of India. And the l-League, the predecessor of the Indian Bundesliga, was launched in 1996. The Indian Super League (ISL), the country’s second professional league, followed in 2013 and is far better known. Its clubs either belong to or have been co-founded by Bollywood stars. They include: Mumbai City FC (co-owned by actor Ranbir Kapoor); NorthEast United (owned by actor John Abraham) or FC Pune City (co-owned by actor Hrithik Roshan). More film stars will be on the green carpet in Mumbai later in the year when they play against cricket stars in the Celebrity Clasico. Yet the large grounds in the city of 22 million people are traditionally reserved for cricket or horse racing. In the narrow lanes of the city, boys with cricket bats wait to strike next ball. 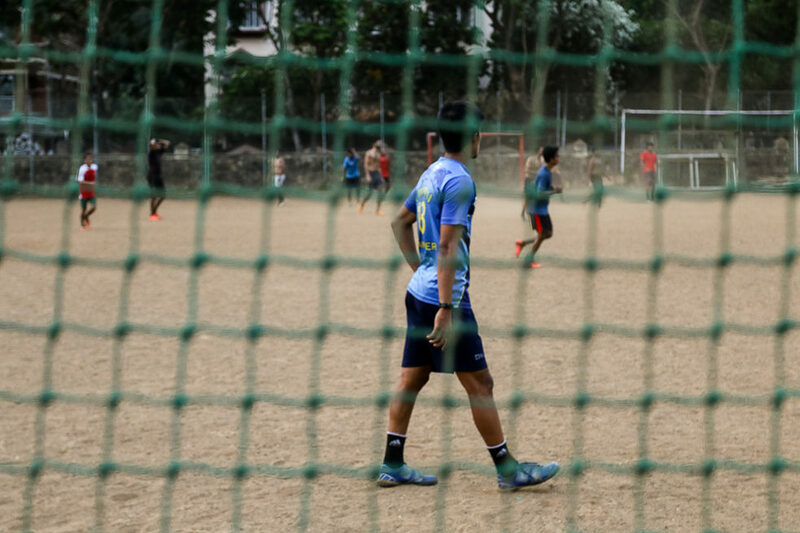 Yet if you happen to be in a part of the city like Bandra, you can also see the boys playing football in the early morning and evening hours on the grass, which is sometimes completely brown, as is the case at St Andrews Turf Park, a school playing field, on in private grounds. The sun is about to set, yet play continues at St Andrews Turf Park in Bandra, Mumbai | © Natalie Mayroth It is shortly after six and still a hot 31 degrees Celsius. Neapun, 17, comes from the ground, wiping the sweat off his face. When he and his friends kick the ball they create a brown cloud of dust, a mini tornado. The ball, in the eye of the tornado, is being kicked around the rest of the field. His round is over for the day, but others will continue playing here until the sun goes down. ‘Most people in India only know Virat Kohli (a famous cricketer). But all the boys here know of Barca (FC Barcelona) and Madrid!’ says Neapun. He and the players at the St. Stanislaus football ground, St Andrew’s or the new Neville D’Souza Football Turf, prove that he who seeks football hearts in Mumbai shall also find them. It will be a while in India until #FootballTakesOver. Besides three Olympic football tournaments in the mid-1920s, and besides qualifying for the upcoming Asian Cup, Indian football has no bigger success to show at international level. Having earned a spot at the men’s World Cup held in 1950 in Brazil due to withdrawals, the Indian national team declined the invitation to play because FIFA had only just banned barefoot play. The team never made it to the big stage again. In the qualifying rounds for Russia 2018, the team was at the bottom of Group D, below Guam, and was eliminated on 12 November. However, the fact that India will not be there does not bother the kickers from Bandra. ‘We need some more time,’ says Neapun. In the meantime, he will watch the Portugal and Germany matches. Natalie Mayroth works as a journalist and photographer and has reported in the past primarily on China and India. She focuses on social and cultural topics – from gender equality to pop culture. She graduated from LMU Munich with a Masters in European anthropology, sociology and Iranian studies.